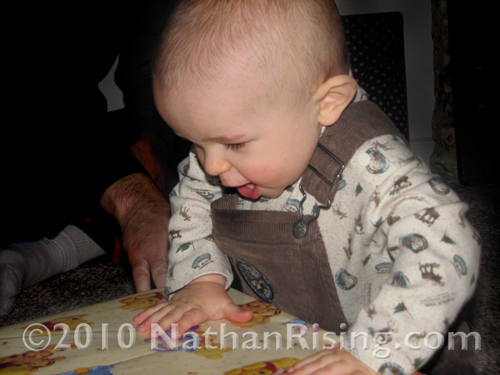 NathanRising » Nathan’s First Birthday! Well, we celebrated Nathan’s birthday this weekend! I still can’t believe my baby is no longer considered an infant. He’s a officially a KID now. With opinions. And attitudes to go with those opinions. But it’s funny because when I look at him, I still see my little baby. Never mind he’s not 100% dependant and no longer drinking out of a bottle. I mean, how can he not still be a baby? It’s only been a year. It was only a short year ago that he inhaled his first breath. So how can he have possibly grown so much in such a short period of time? He’s still my baby and I have a funny feeling HE ALWAYS WILL BE. I’m afraid to blink. Time is passing me by. 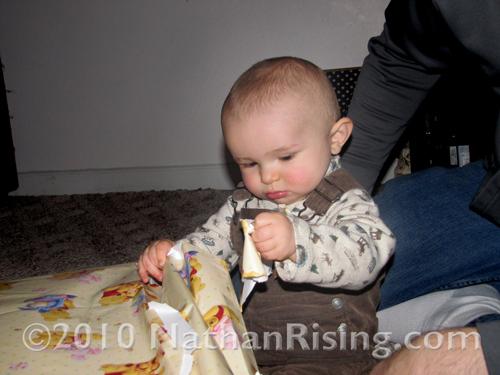 Speaking of growing up, guess what Nathan did on his birthday! HE PULLED HIMSELF UP. ALL THE WAY! Before now, he would attempt to pull himself up but would only make it halfway before plopping back down with a thud. But he did it, he pulled himself up into the standing position! He only just started crawling not even two weeks ago. I wonder how soon it will be before he takes his first steps and starts cruising on the furniture. 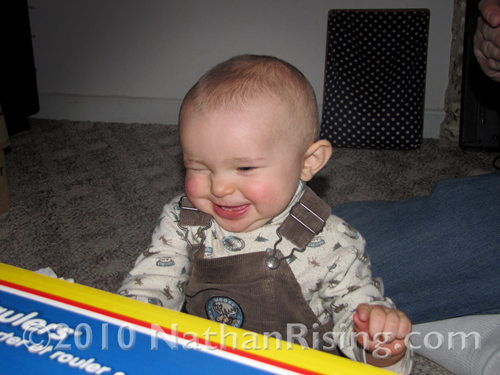 So here’s some super cute pictures of his very first birthday for you to enjoy. I don’t know what this is, Mommy, but it looks fun! 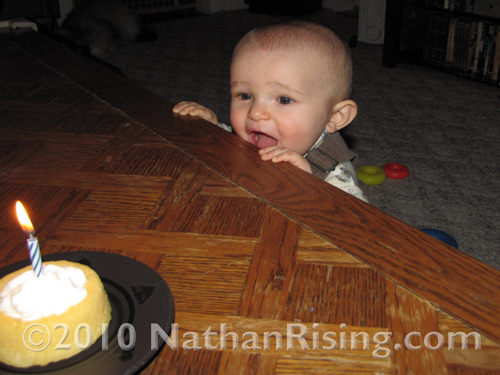 But Nathan did not like the cake. So Nathan still isn’t big on “people food” yet. 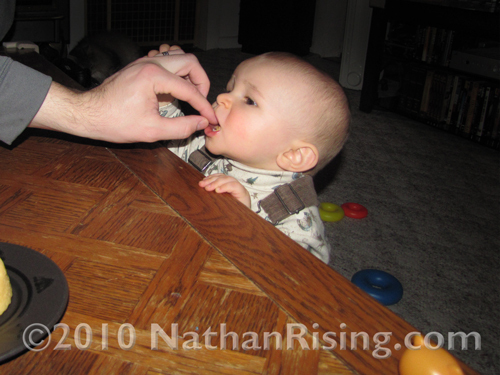 He still likes his food pureed, so we weren’t all that surprised when he didn’t like his birthday cake. Which is why we gave him a small bite to start off with. 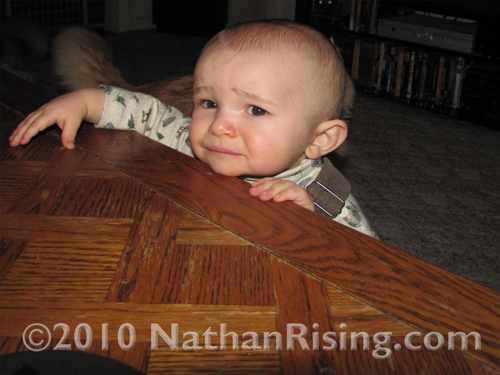 But Nathan still let us know in no uncertain terms that he wasn’t happy with our trickery. But even with a few tears here and there, his first birthday was a lot of fun. 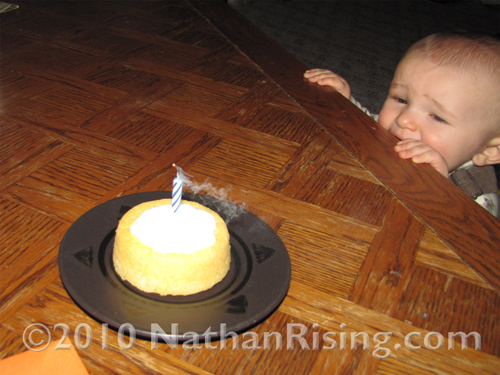 Well, Nathan had no idea what all the fuss was about, but all the adults really enjoyed it. There’s always next year for the Messy Cake Picture, right? This entry was posted by Jen on February 28, 2010 at 11:13 pm, and is filed under Holidays and Special Occasions. Follow any responses to this post through RSS 2.0.You can leave a response or trackback from your own site. Just more cake for Mommy and Daddy! Cute pics. Happy birthday to Nathan!